i’m baaackk! after traveling for three weeks, it feels good to be back in the kitchen again. 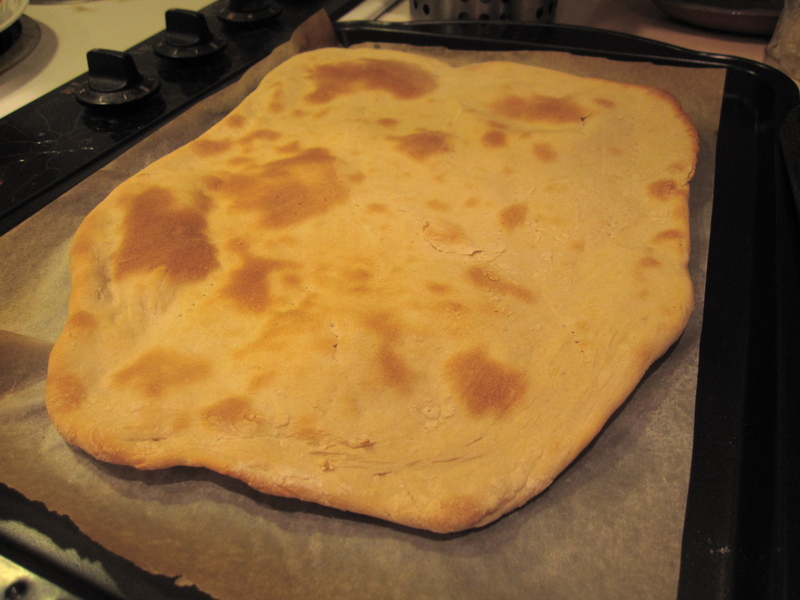 this sunday night, i made two different kinds of flatbreads for me and my mom. i’ve starting seeing more restaurants offer flatbreads as appetizers like Brio or Victor Tango’s and i thought i’d try it out. Plus, it gave me an opportunity to finally start baking with yeast (first time)! Mix water and yeast in a electric mixer bowl and let stand 15 minutes. Pour in 2 cups of the flour and mix manually for one minute. Cover the bowl with saran wrap for at least an hour. Add the salt and oil, then flour 1/2 cup at a time to form a dough, using the dough hook. After the dough is formed, knead the dough with your hands for 5 minutes. 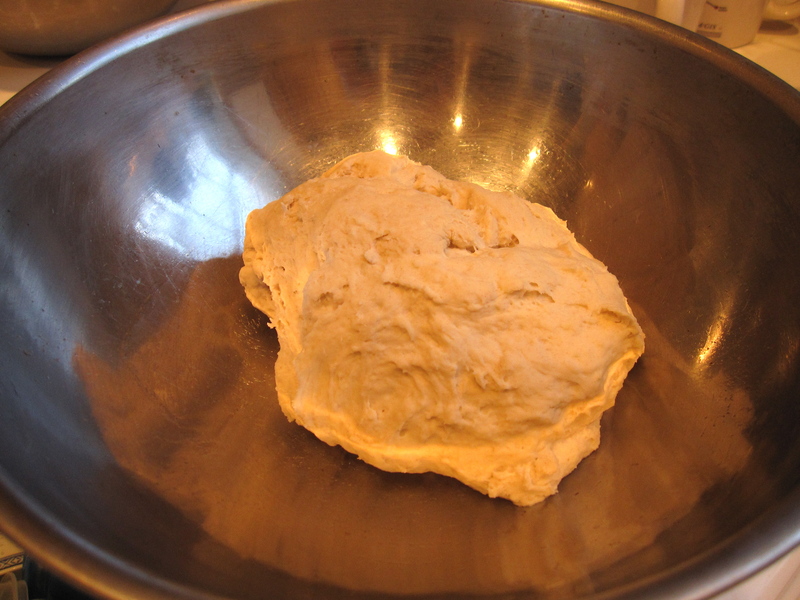 Place the dough in a clean oiled bowl and let rise, slowly, about 2 1/2 hours. While the dough was rising, I prepared the toppings. 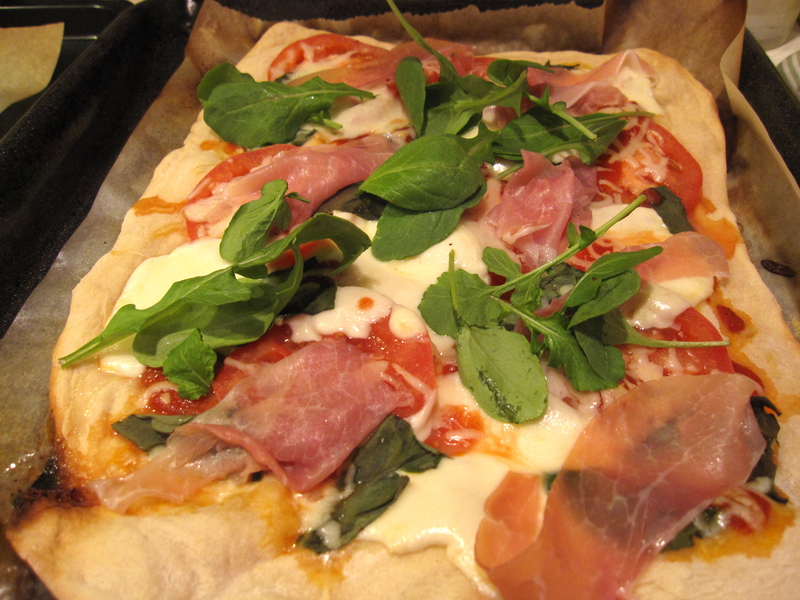 The first flatbread was a margherita pizza (sliced tomatoes, fresh mozzarella, basil), and after that was baked, I put prosciutto and arugula on top. 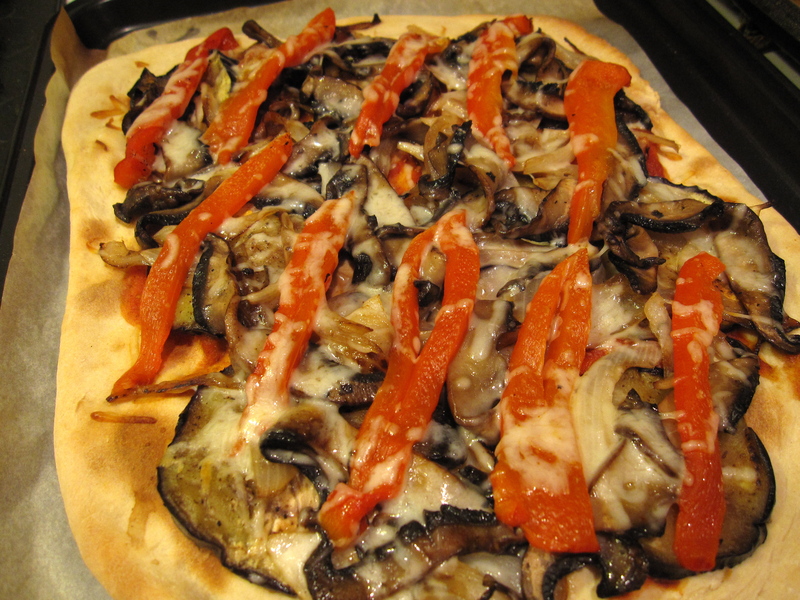 The second flatbread was more salty and savory with onions, portabella mushrooms, sliced eggplant, roasted red peppers (store-bought), with shredded mozzarella. 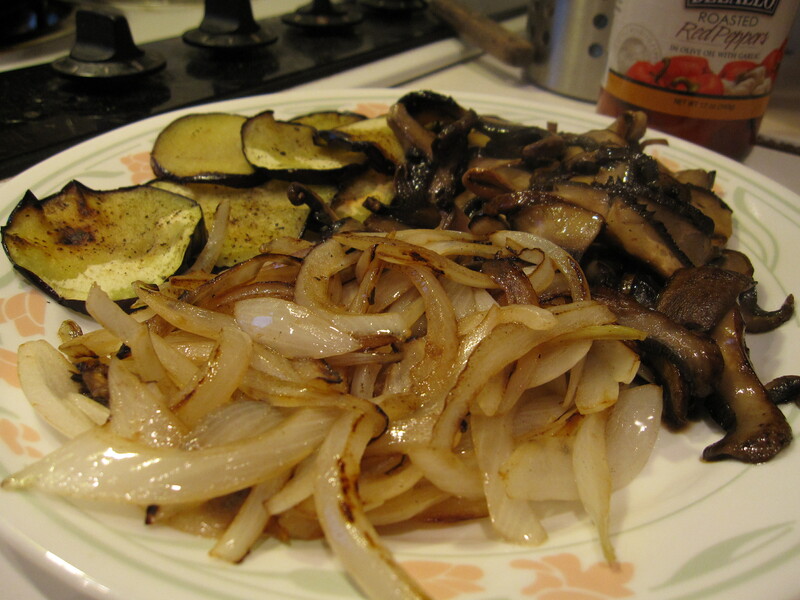 I sauteed the onions, mushroom, and eggplant separately before putting it on the bread. After 2 1/2 hours and the dough has risen, preheat oven to 450 degrees. 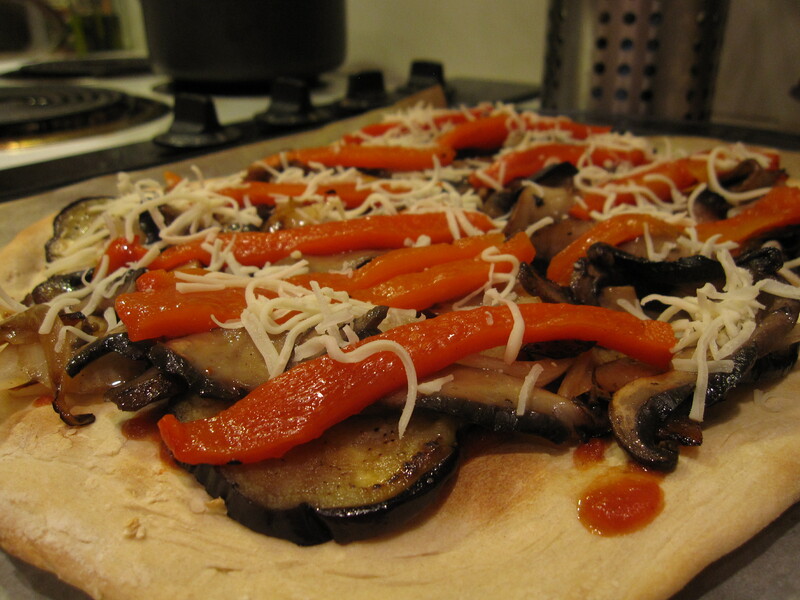 Roll out and flatten the dough into two oven sheets. 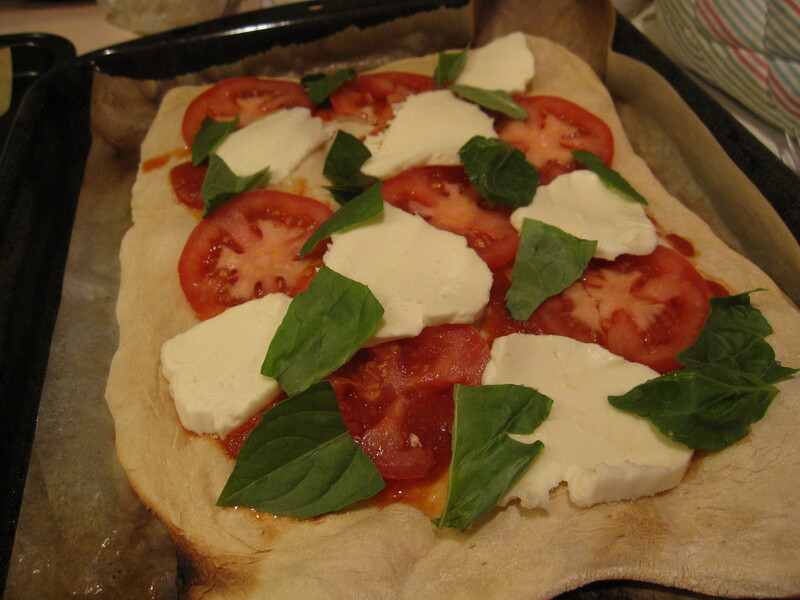 Lightly oil a baking sheet, place the dough on the sheet and prick the surface with a fork. Bake for 10 to 12 minutes until lightly golden brown. Now, the fun part. Putting on the toppings! I put a little bit of tomato basil soup (next entry to follow) over both flatbreads to act as a base, but it’s not necessary. Most of the ingredients are already cooked and the ones that aren’t bake in the oven pretty quickly anyways. Bake at 375 for 10-12 minutes. Slice and enjoy! 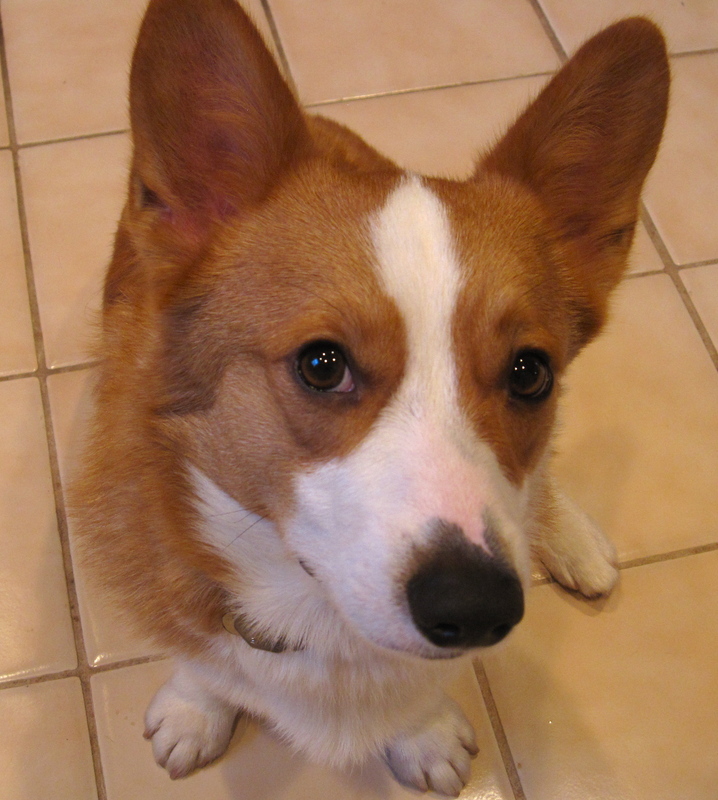 Bruno waited patiently throughout the entire process, so I gave him a few bites of arugula (only raw and healthy human food for him). How can you resist that face?? ❤ pizza. and that sounds surprisingly easy, if time consuming.